Big Bang Black Holes, Comets and Ball Lightning with Rigid String Nuclei in Quantum FFF Theory. 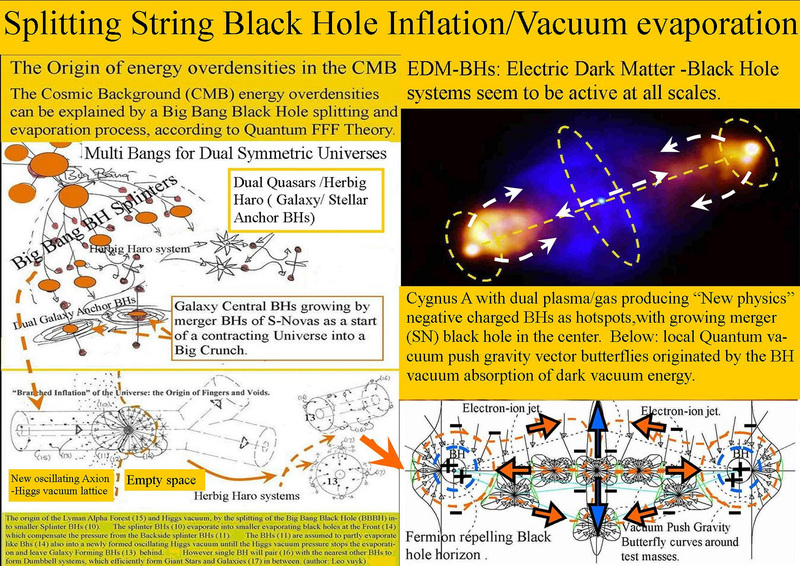 Imho, Black hole nuclei are NOT singularities but bunches of rigid vacuum Strings, compressed by the incoming vacuum flux pressure. Black holes have even no mass (or inertia) because they do not emit gravitons. 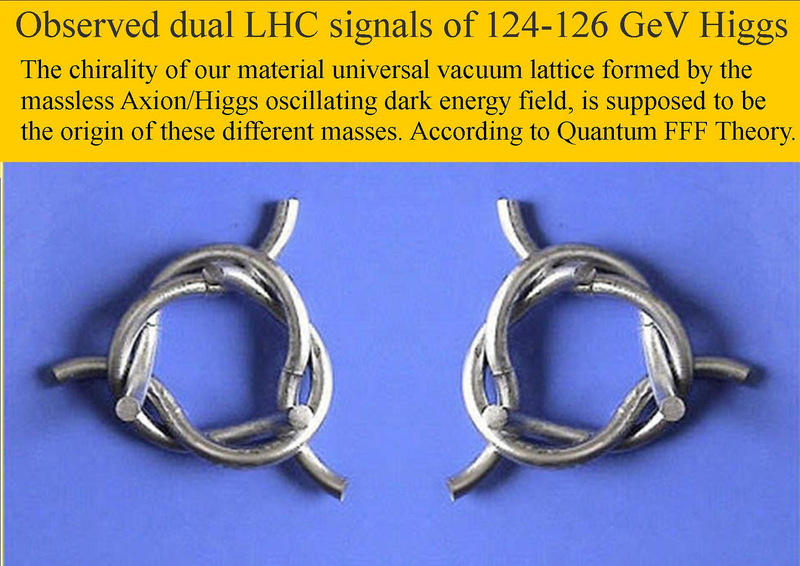 However they seem to have emerging quantum gravity from the external flux vacuum ( Casimir) pressure. 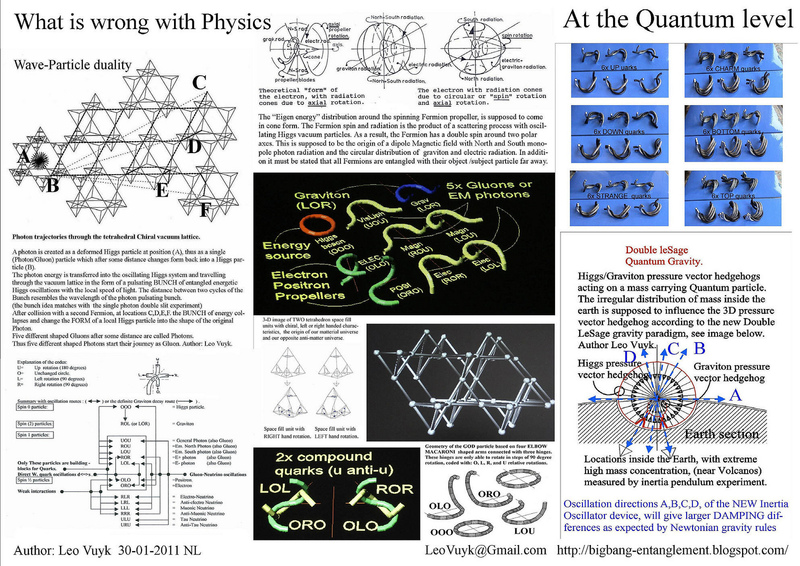 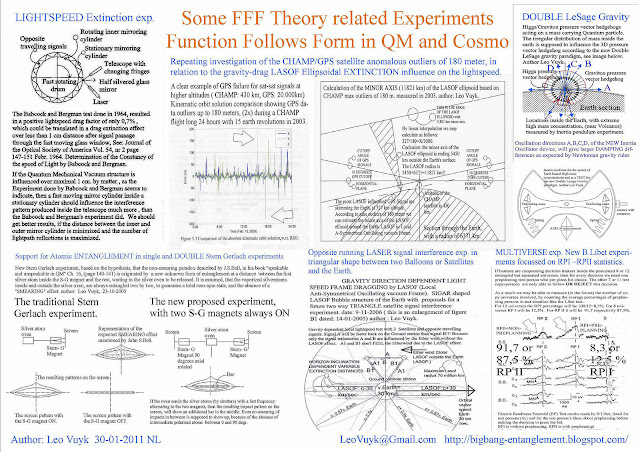 Reason to postulate that the Quantum gravity picture should show, that Gravitons are vacuum flux particles converted by Fermion collision, which exert less individual collisionary pressure on other Fermions than non-converted vacuum quanta coined "massless Axion/Higgs" vacuum field particles. 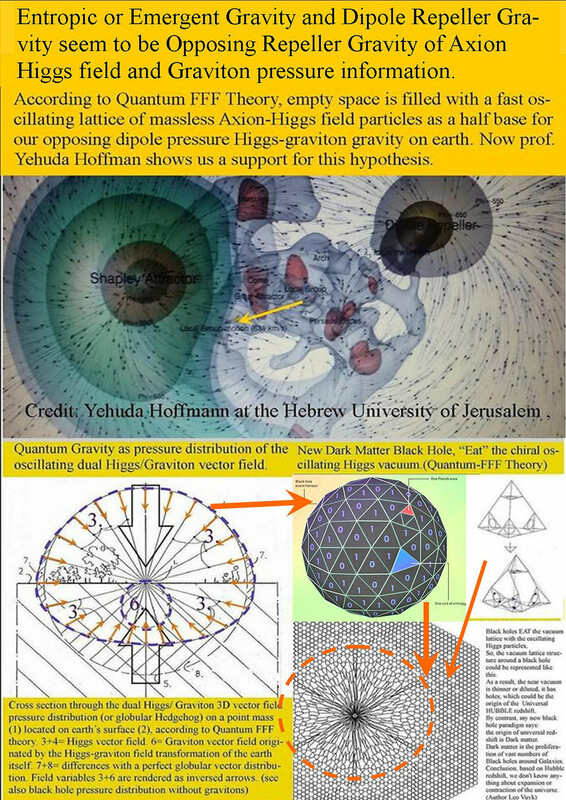 Interpreted by me as dipole repeller gravity. 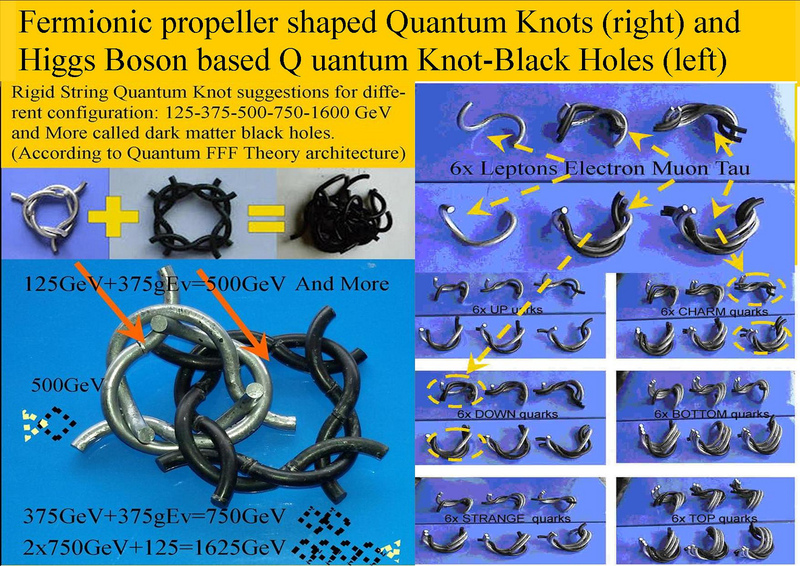 Bosons should also be able to convert vacuum strings by collision conversion into as much graviton strings. see: Emergent Gravity by Dipole Repeller Rigid String Pressure the Origin of Quantum Gravity and Non Inertial Black Holes. 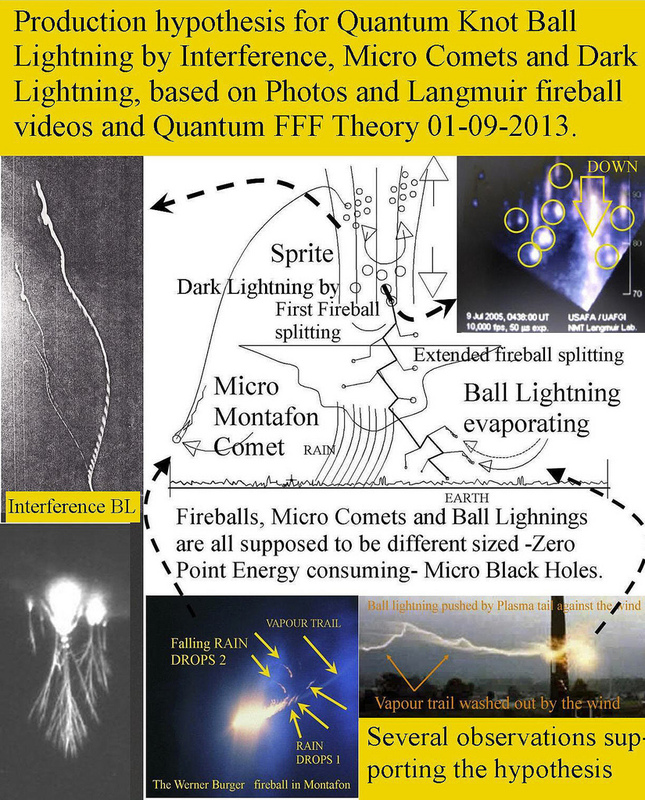 Interference black hole string nuclei as Comets and unstable Earth bound Comets and Ball lightning. Below: Earth bound Comet splitting a small nucleus without icy shell able to plow into the wind opposite to the "mother"nucleus with a massive ice shell accelerated from a different location with a different wind direction. 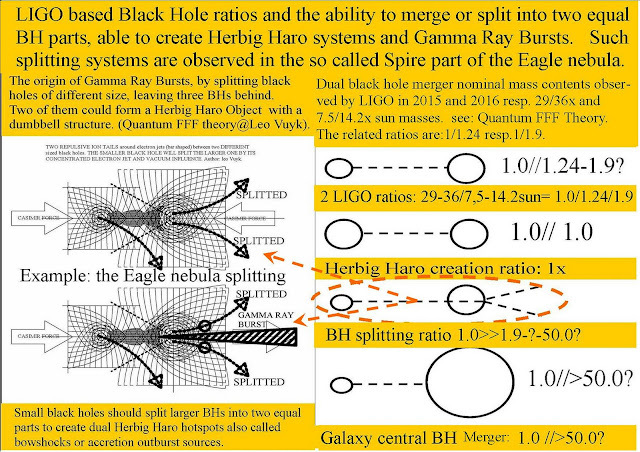 Equal sized black hole nuclei do not merge into each other! 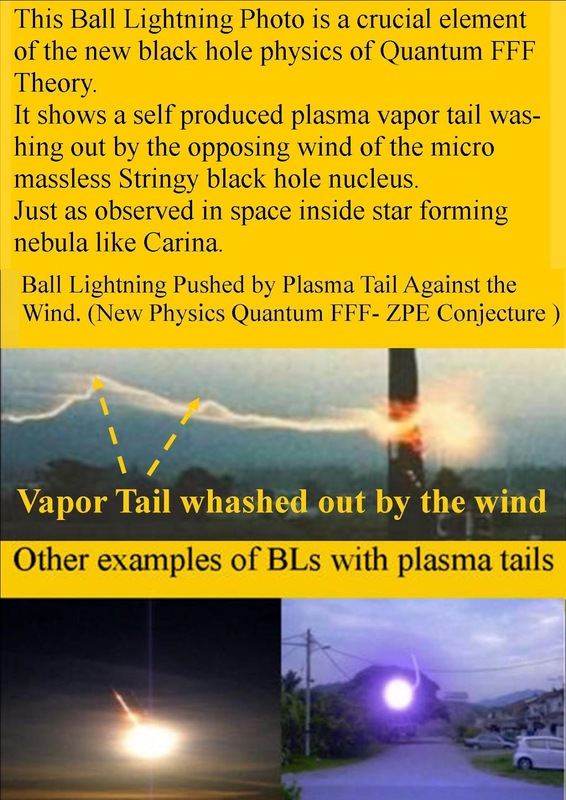 Fermiones ( propellers) even do not fall into BHs, they are all pushed away! 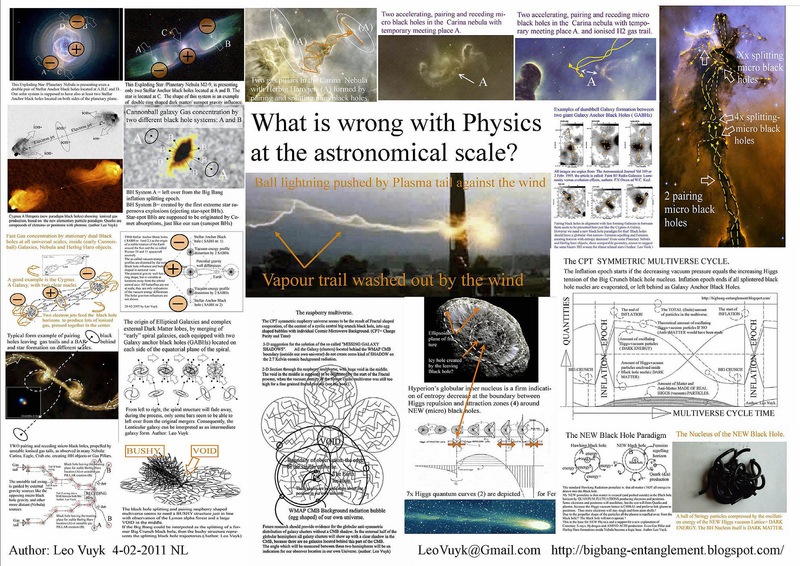 into jets. The Big Bang should be interpreted as a splitting dark matter black hole stringy nucleus, filling Empty Space with a stringy flux vacuum lattice except for some early inflation blind spots. According to the Quantum FFF Theory conjecture, we live inside one of a specific number of Charge Parity symmetric copy universes coming out of a huge Axion/Higgs rigid string black hole nucleus explosion. 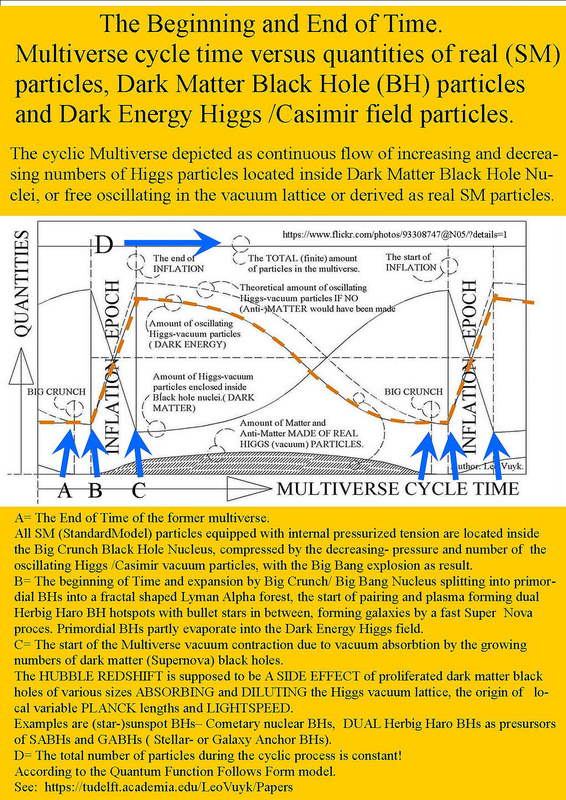 Exploding into (1) Chunks of Primordial Dark Matter Black Hole (Primordial black holes) and (2) into the oscillating Axion/Higgs field string flux-vacuum by black hole evaporation. 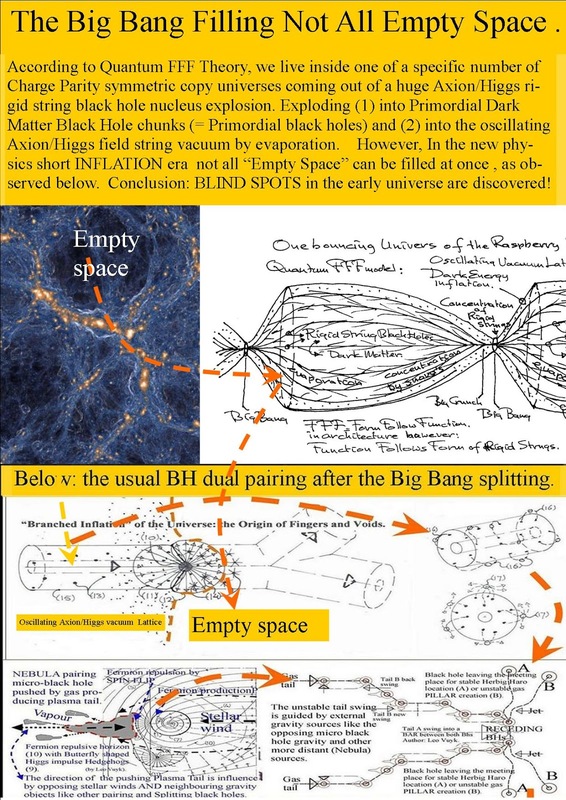 However, In the short inflation era not all “Empty Space” can seemingly be filled at once , see image below, which seems to be the origin of several blind spots found in the early universe. However In the early inflation this vacuum lattice seems to have holes between the Lyman Alpha forest. 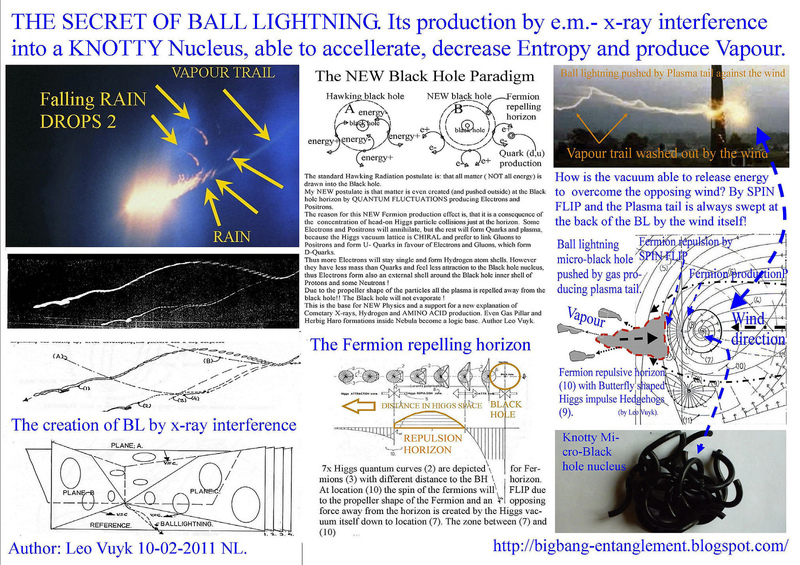 The secret of interference black hole magnetic monopole stringy nuclei. 2x Early GABHs in the Perseus Galaxy Custer. 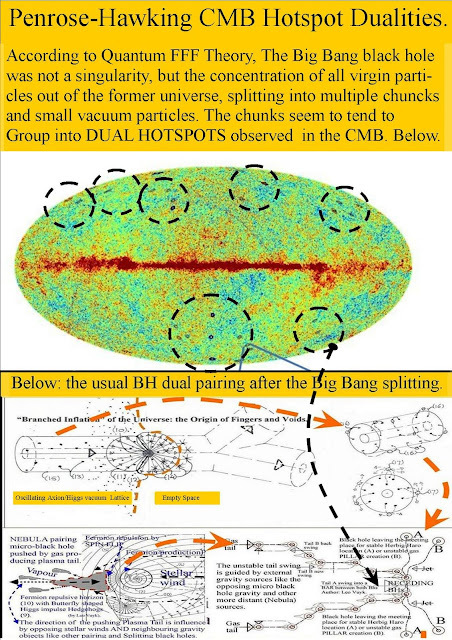 2x GABHs in the Perseus Custer. 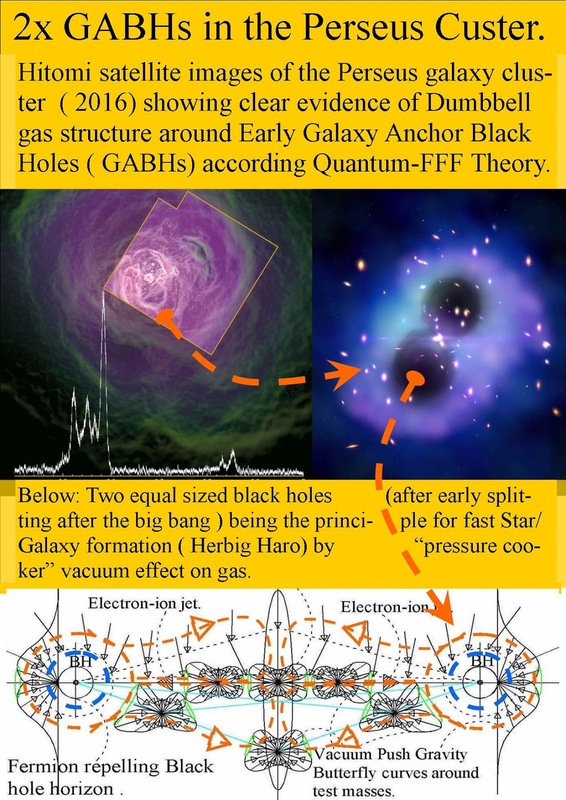 Below: Two equal sized black holes (after early splitting after the big bang ) being the principle for fast Star/Galaxy formation ( Herbig Haro) by “pressure cooker” vacuum effect on gas. 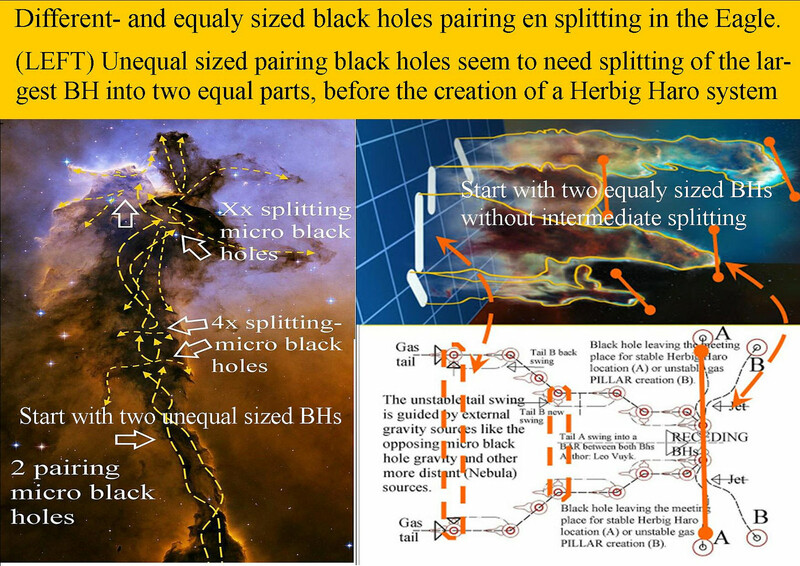 The role of black holes in galaxy formation. 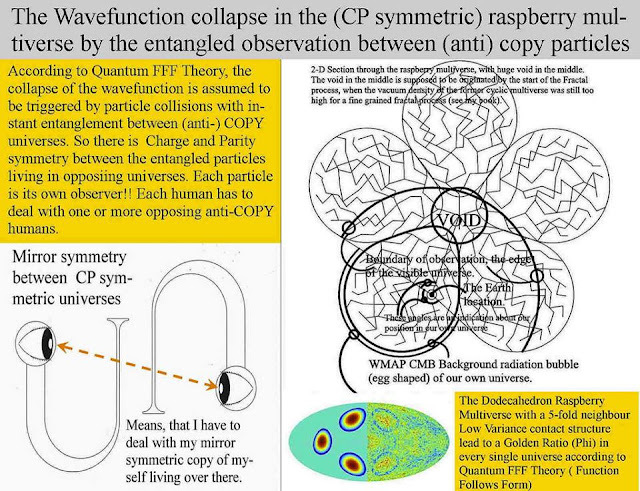 It sounds obvious, but in the quantum realm, the saying doesn’t always ring true. 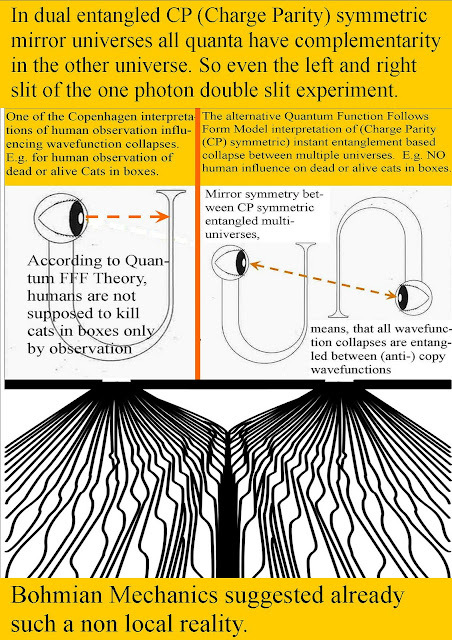 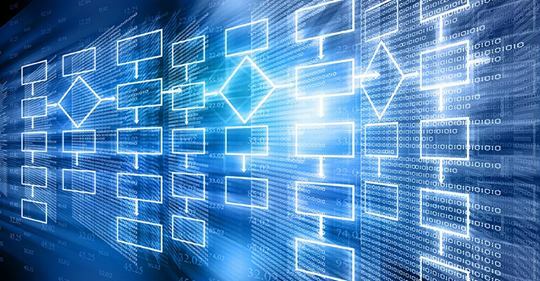 A new quantum device can jumble up a sequence of two events so that they take place in both orders simultaneously, researchers report in a paper in press in Physical Review Letters. Bohmian Double Slit Interpretation by Dual Entangled Universes, and the Benjamin Libet experiment. A Testable CP Symmetric Multiverse Model by Extended Experiments, Done by the Late Benjamin Libet in 1964. 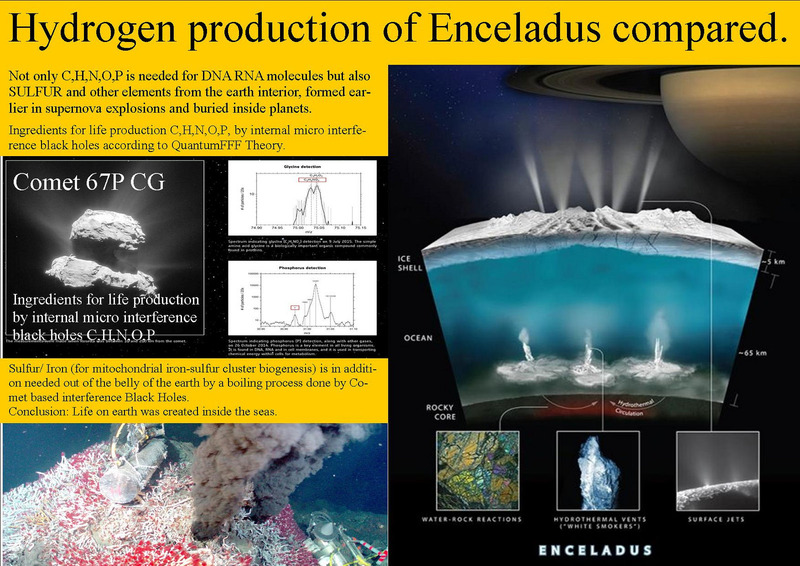 Solving the Cusp/ Core Proble in Dwarf Galaxies. 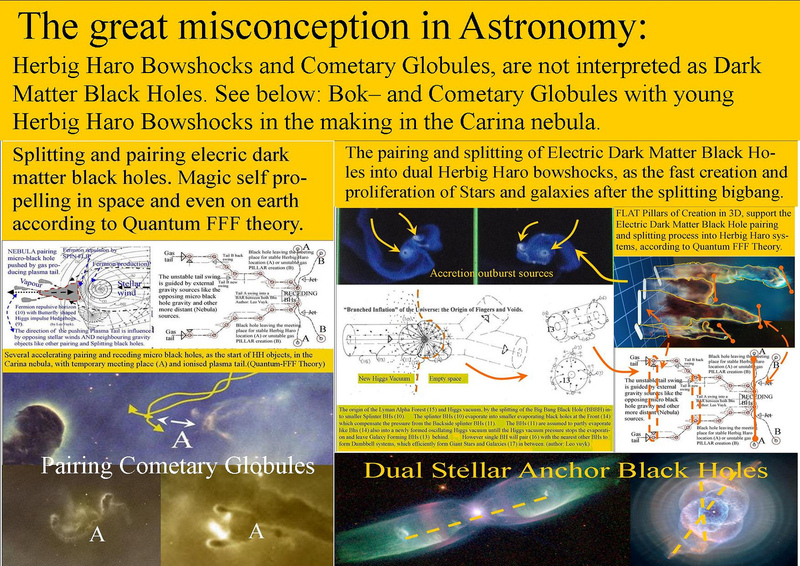 1; Dwarf Galazies with MORE star formation have LOWER central matter densities. 2; This is reason to suggest, that the local dark matter is heated up ( cusps) by baryonic processes. 2 Star formation stops around central black holes growing by eating smaller black holes. 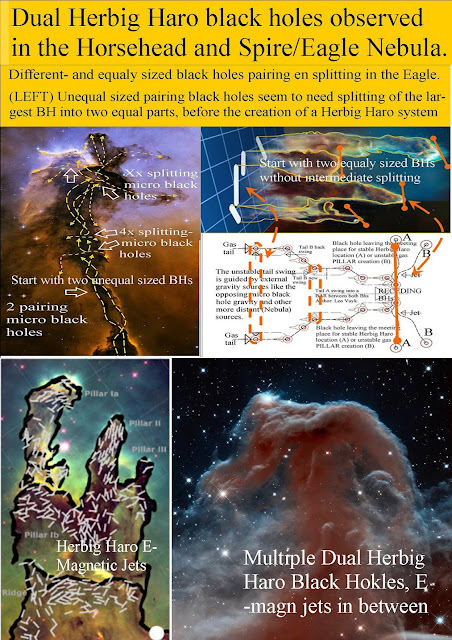 3 Star formation can only start between two equal sized black holes often recognized as Herbig Haro systems. which represent the center of the cusps. 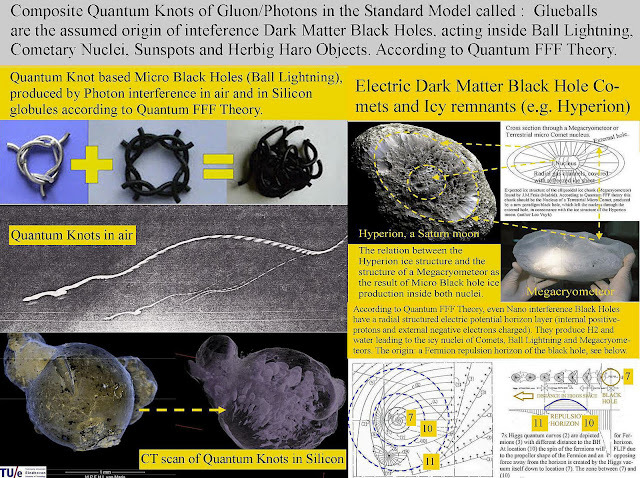 Dark Matter Black Hole Galaxy Hierarchy according to Quantum FFF Theory. 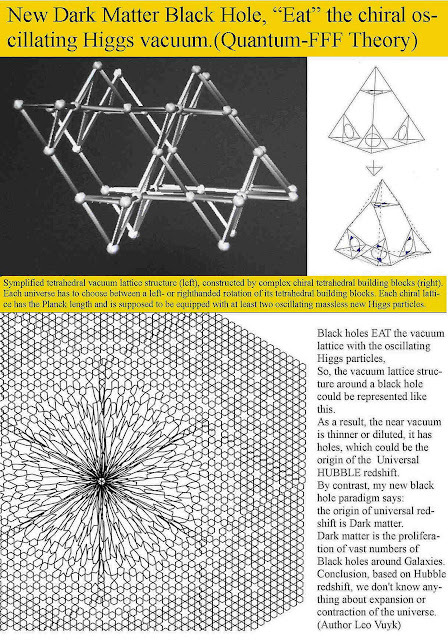 This idea is base for new physics of black holes !! 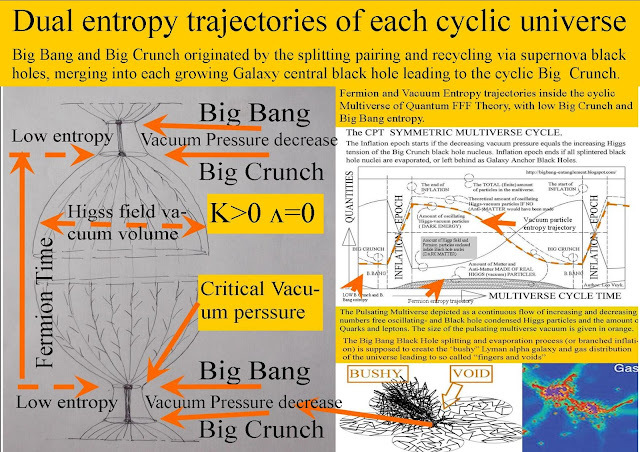 Not based on a singularity but on concentration of black holes into a Big Crunch black hole stuffed with virgin particles able to split again into splinters and chunks and evaporate into a new vacuum Axion Higgs field. 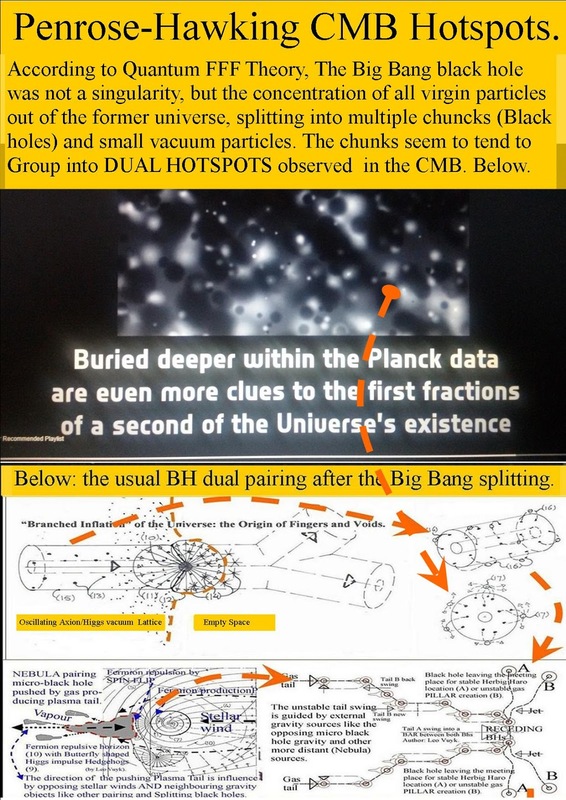 So: the "bouncing multiverse is coming!" 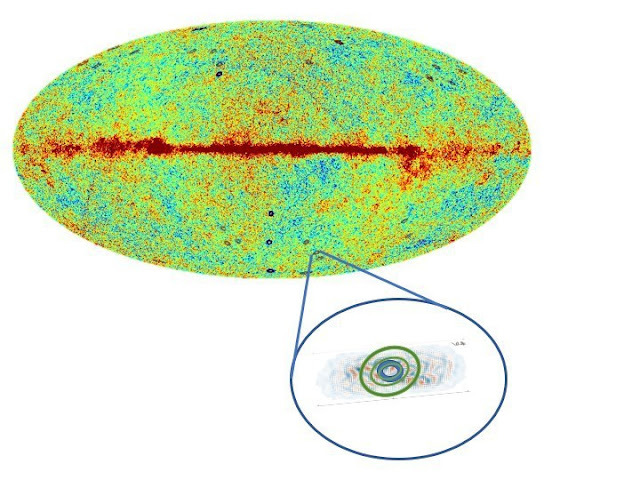 Smaller hotspots buried deeper in the Planck data. The Big Bounce depicted for only one universe according to Quantum FFF Model. 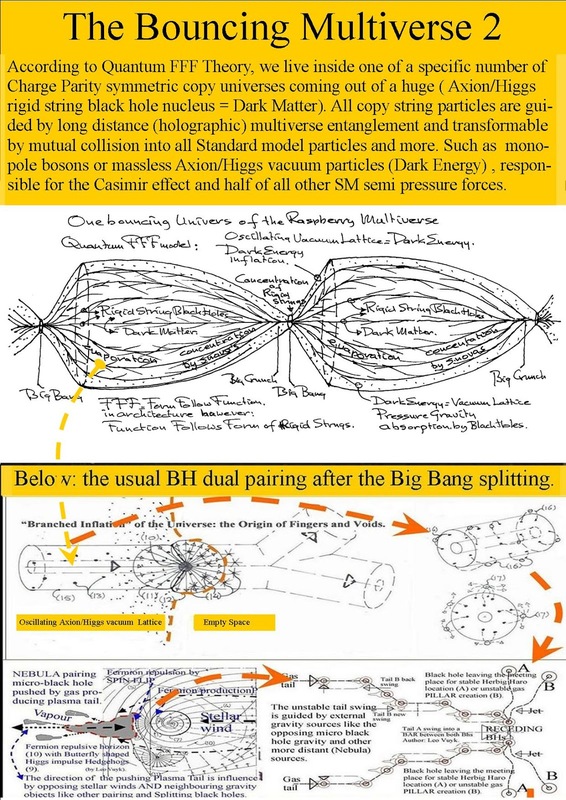 The Splitting Electric Dark Matter- Black Hole- Big Bang and the Cyclic Multiverse. 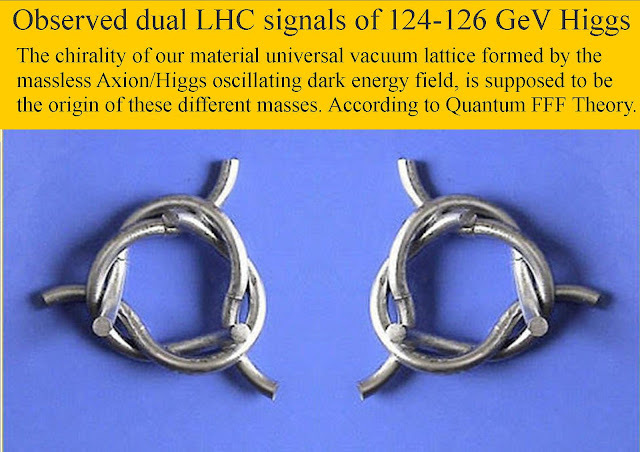 According to Quantum FFF Theory, we live inside one of a specific number of Charge Parity symmetric copy universes coming out of a huge ( Axion/Higgs rigid string black hole nucleus = Dark Matter). 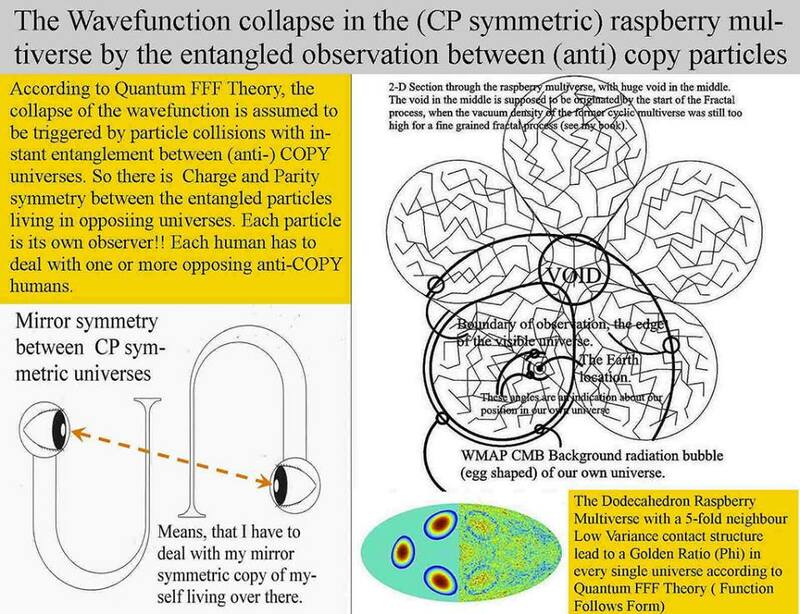 All copy string particles are guided by long distance (holographic) multiverse entanglement and transformable by mutual collision into all Standard model particles and more. 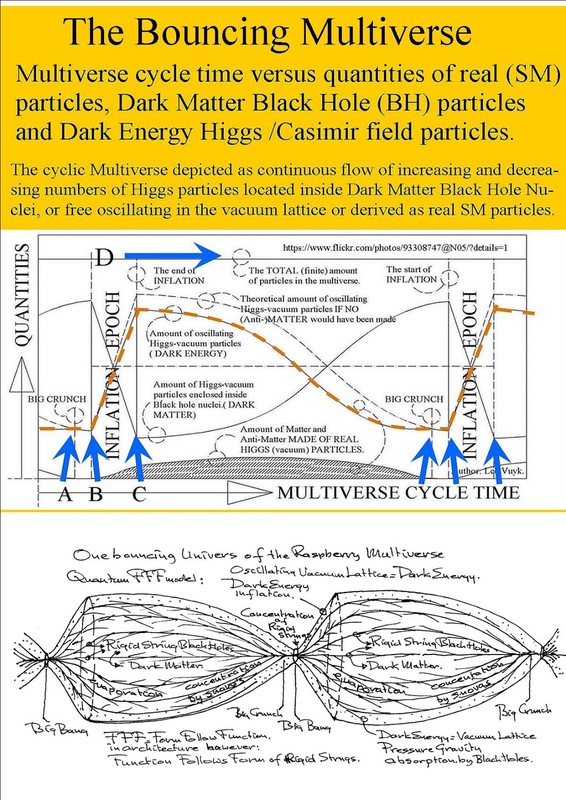 Such as monopole bosons or massless Axion/Higgs vacuum particles (Dark Energy) , responsible for the Casimir effect and half of all other SM semi pressure forces. LOOK at the Hawking points ! 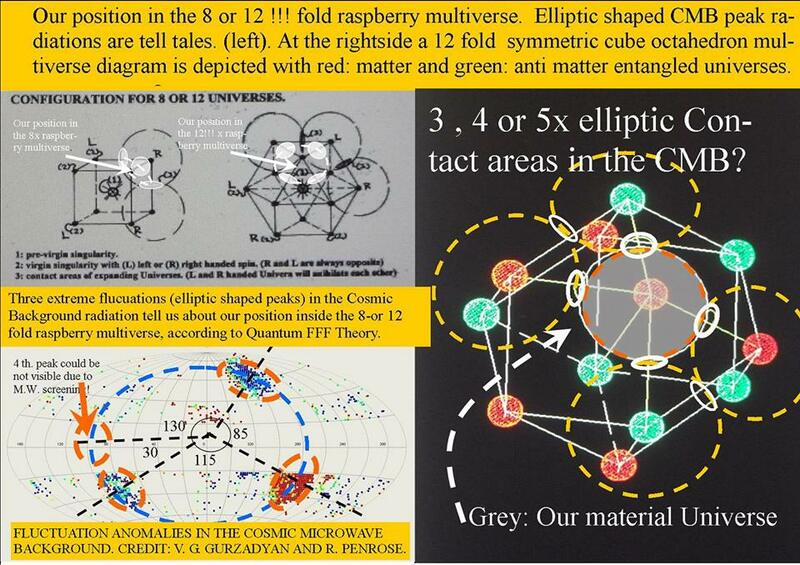 Roger Penrose at all. seems to know that these points are the remnant black holes of a former universe. 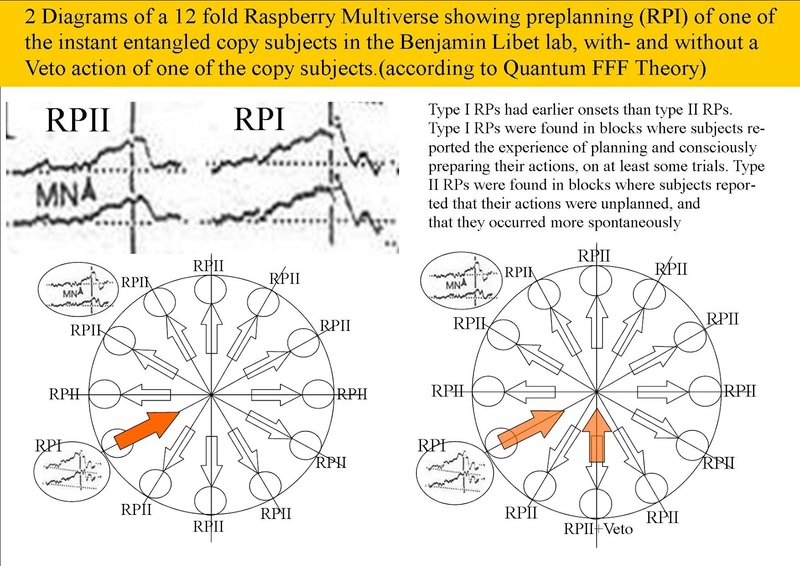 Of course ! Multiverse cycle time versus quantities of real (SM) particles, Dark Matter Black Hole (DMBH) nuclear particles and dual oscillating Dark Energy Axion/Higgs /Casimir field particles. 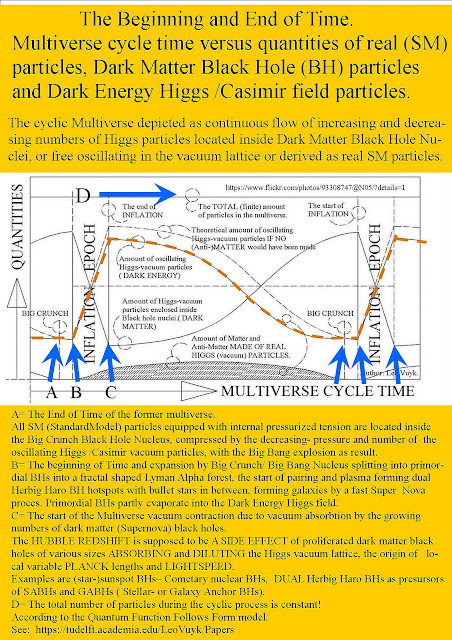 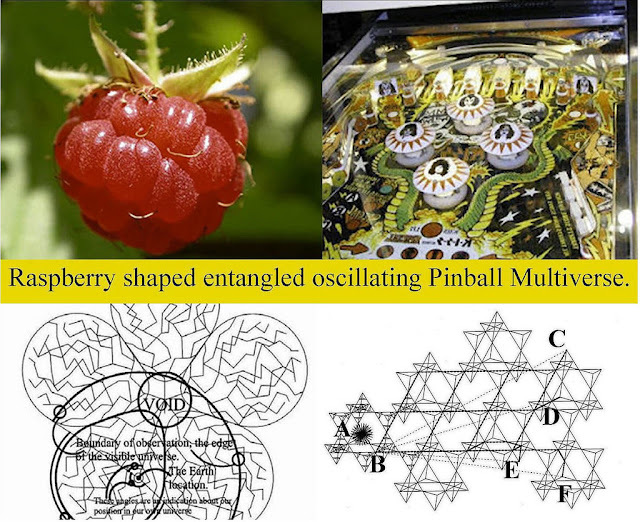 The entangled cyclic Multiverse depicted as continuous flow of increasing and decreasing numbers of Higgs particles located inside Electric Dark Matter Black Hole ( EDMBH) Nuclei, or free oscillating in the chiral Tetrahedron shaped vacuum lattice or derived as real SM particles. All SM (StandardModel) particles and most Axion Higgs particles equipped with internal pressurized tension are located inside the Big Crunch Black Hole Nucleus, compressed by the decreasing- pressure and number of the oscillating Axion/Higgs /Casimir vacuum particles, with the Big Bang explosion as result. B= If the decreasing Vacuum pressure is equal to the growing Big Crunch Black Hole ( BCBH), The beginning of Time and expansion has started, by the Big Crunch/ Big Bang Nucleus splitting into primordial BHs into a fractal shaped Lyman Alpha forest, the start of pairing and plasma forming dual Herbig Haro BH hotspots with bullet stars in between, forming galaxies by a fast Super Nova process. 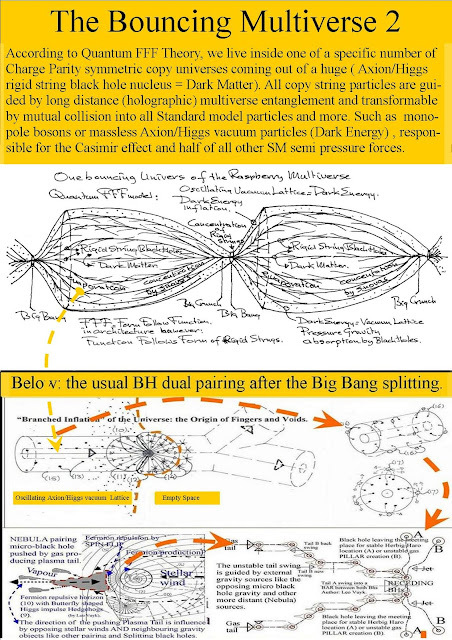 Primordial BHs partly evaporate into the Dark Energy Axion/Higgs field. Primordial Electric Dark Matter Black Holes Outside Galaxies Responsible for the Creation and Contraction of a Cyclic Multi-Universe.